Liberty horse training gives your horse the chance to bond with you in a way not possible with other styles of horse training. When a horse is bonded to you, he will check on you from hundreds of feet away. There is an invisible energy between the two of you which has a strong influence over his actions. For example, you hear about dogs who won’t leave their person when an accident occurs in the forest, away from home. But what about a horse? Instead of running back to the barn or trailer when there is trouble, a horse trained with this “draw” or “elastic bond” will not leave his person either. 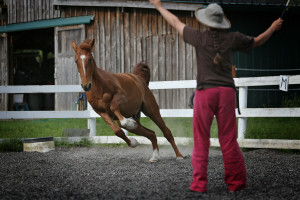 This is a far cry from what usually happens as many horse people painstakingly know. Because the horse will see that when he is close to you, he is safe and calm, he will seek you out to help him. This means on a tricky trail, he will trust you to keep him safe and he will feel safer with you than even his horse friends. 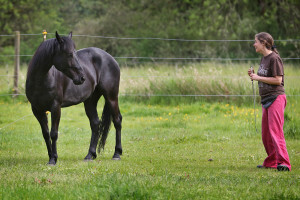 To create the draw, you must first have established a safe bond with your horse so he will not become scared by your actions. First, warn him that you will be pushing him strongly away from you. Step back as you send him on a “Go away” so he does not kick at you. 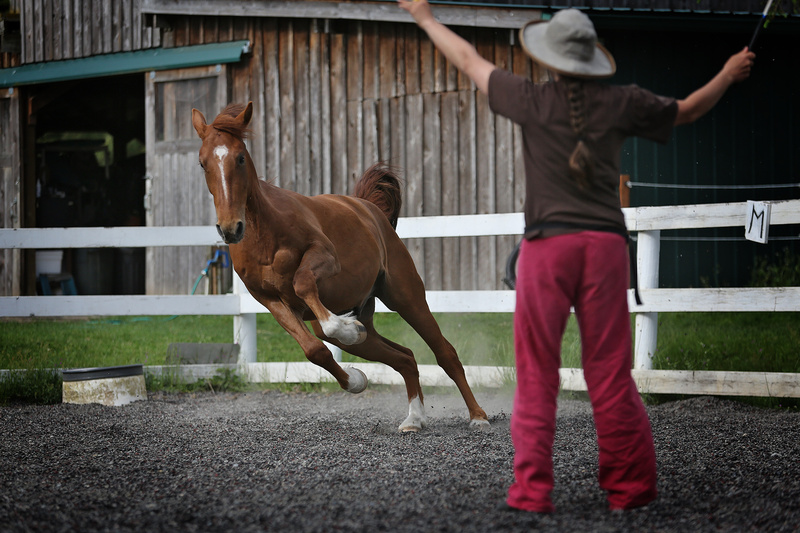 You will push the horse out with strong energy away from you as if to say, “There is a cougar, run!” You can have fun with this exercise as i do in this photograph. Upon your command, you then draw the horse close to you. The trick is you want to calm him down immediately. In this way you can create big energy from him while quickly settling or grounding or quieting his energy into stillness as he stands by your side safely. By having this level of say in his life, by pushing and pulling at this invisible electric bond between you, you can create big moves in dressage or have a gentle patient and still horse as a little child scrambles to get on him. All this is possible in one horse, it’s all about the energy.